﻿ Fakes: A traditional Greek vegan soup recipe! One of the best vegetarian recipes for legumes! This is a traditional Greek recipe which is a staple in every home here: a lentil soup called Fakes. Yes, we know, "fakes" sounds funny in English and you can make a lot of jokes about it, but you will get serious when you taste the amazing earthly flavor of this simple and yet so tasty Greek recipe. Fakes is another characteristic Greek comfort food, consumed during the greatest part of the year (Fall to Spring) and is amazing for any cold day. This brown lentils soup is widely popular in Greece, and it's a low cost, humble food, which is both tasty and nourishing; lentil is a healthy legume, that is high in fiber, but also contains a significant amount of proteins! It will definitely fill you up and you'll probably eat as much as you can, asking for a second serving. 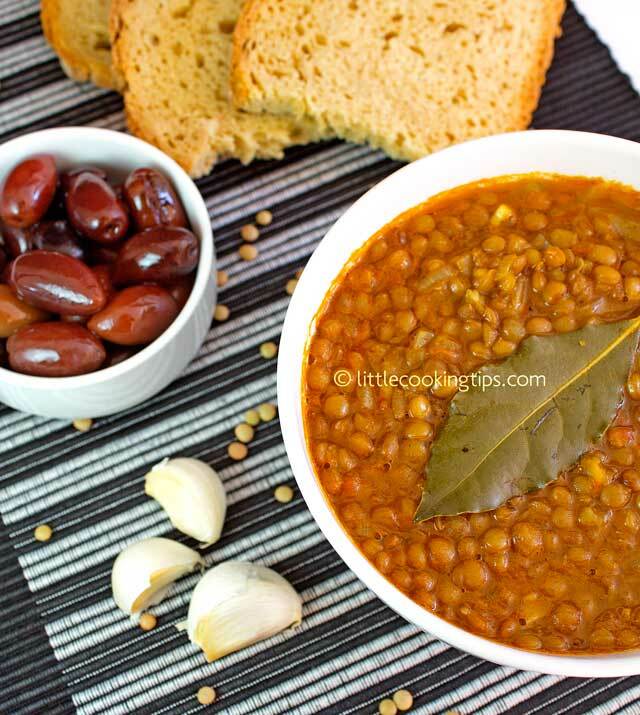 This lentils soup is a vegan dish, as it contains no meat or dairy, and therefore is also suitable for the Greek Orthodox Fasting, which is one more reason why people love this dish here in Greece. During Lent, Greeks consume huge quantities of lentils soup. Most of the people in Greece have memories of a hot dish of lentil soup since their early childhood. Among the legumes, lentils are very popular, and perhaps the easiest choice for a healthy meal for kids. Indeed, we both have memories of coming back from school and finding out that our mamades (moms) had cooked lentils for lunch. It wasn't perhaps our favorite food, as we would definitely prefer something with meat; it was however a dish we learned to eat for its healthy benefits. Plus, it was tasty, especially when combined with olives, anchovies, fresh bread and sometimes a spread (like taramosalata or melitzanosalata). Another great aspect of this dish, is that lentils as a legume, don't need to be soaked overnight like the beans do; they don't need to be prepared a day before. You just open the box/pack, rinse them and use them in your recipes. Just like Fasolada, this dish is cooked two ways: with, or without tomato. The "white" version does not include tomato, while the red one -which is our favourite- does. The recipe we are sharing here is the traditional Greek recipe for lentils, that includes grated tomato and tomato paste. The spices used to enhance this traditional soup are the bay leaves and the garlic. What we did different in this version however, which is they way we like to cook fakes at home, was this: we added a little curry powder. The amount of curry used, does not make the dish taste like lentils taste in India:) All it does, is enhancing the flavors: we used two teaspoons for the whole pot. We also prefer this dish a little thick and not too watery. This is called “hiloma”, meaning the starch from the lentils has released and has thickened the soup as a result. As mentioned again in our Fasolada recipe, this is often a desired result in Greek legumes dishes. If you like a more watery (soup-like) result, read the Tips section, for an easy way to achieve this. There are many different versions of this dish some families like to add carrots, some others celery and others make it a bit more spicy by adding chili flakes. You can adjust the recipe to your liking by adding more or less of the listed ingredients and add any spices you prefer. The possibilities are really endless! This soup is usually served with a little red wine vinegar and some olives or raw onions the side. Some people also serve anchovies or other salted/smoked fish with fakes. You can also drizzle some extra virgin olive oil when serving (extra virgin olive oil is also included in the cooking process). We really think that fakes is one the best traditional and authentic Greek recipes you can try, as it is very easy to make, it’s healthy, it has simple ingredients, and a beautiful, hearty taste! So let's see how to make Greek lentils soup. Preparation: Ιt's important to rinse well the lentils, before cooking them, to avoid any foam during boiling. Put in a large pot: water, lentils, onions, garlic, bay leaves, curry powder, olive oil, salt and pepper. Yes. It's that easy! Add the tomatoes and the paste, stir and continue cooking for another 25-30 minutes. Always keep an eye on the water, especially towards the end and stir often. After this time has elapsed, they should be ready. Taste them (be careful not to burned your tongue). If they are still a bit chewy, this means your lentils were a bit old, so they are tougher. If they are, add more warm water (about 2 cups) and keep cooking them for another 10-15 minutes. Serve the lentils soup in a deep dish, adding a bit of red wine vinegar (optional) to taste. Kalamata olives are a must on the side. 1. Serve the lentils soup with red wine vinegar, Kalamata olives, Greek spreads, raw onions, and/or salted fish or meat. 2.You can also try "taramosalata"(fish roe salad) on fresh toasted bread. Delicious! 3. Before rinsing the lentils, spread them on a large dish and check for any small rocks. During processing/packaging sometimes one or two tiny rocks may have been left inside, and you must remove them. It’s very easy to spot and discard them though. 4. If you prefer your soup a bit more watery, add 500ml (2 cups) more water in the initial ingredients. 5. If you like the classic traditional version of the recipe, just omit the curry powder. 6. Some families also like to add carrots (either sliced or grated) to fakes. Feel free to try it, it will add more flavor. 7. Feel free to add a couple of chicken or vegetable stock cubes into the soup. It'll be evern tastier! Hey, I love the blog - this greek lentil soup looks amazing. I can't wait to try to make it this weekend! I have a feeling that this will be one of my favorite winter dishes. Thanks for posting this! When I saw the title, I was wondering if how it would taste with a bit of cumin, as this (for me) goes well with lentils. I wasn't surprised by the addition of the curry powder. Besides, I doubt it would overpower nearly a kilo of cooked soup! I will let you know how I get on once I've tried it. Looks fantastic, by the way. First, thank you for your comments Colin! Cumin may also be used, we know a friend who does add it to fakes soup. We wanted to present a more traditional version of the dish here, that's why we only added juuuust a bit of curry:) Feel free to adjust the dish according to your own preferences!